An unusual one this. 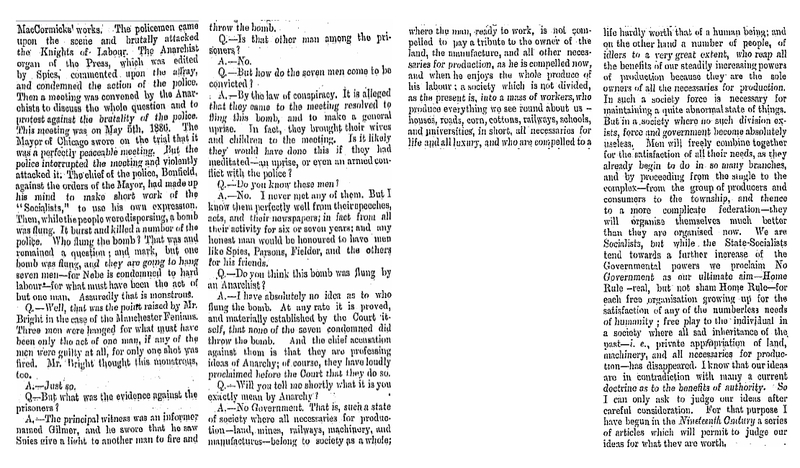 The Freeman’s Journal of October 27th 1887 carried an interview with Peter Kropotkin, well known Anarchist Communist. 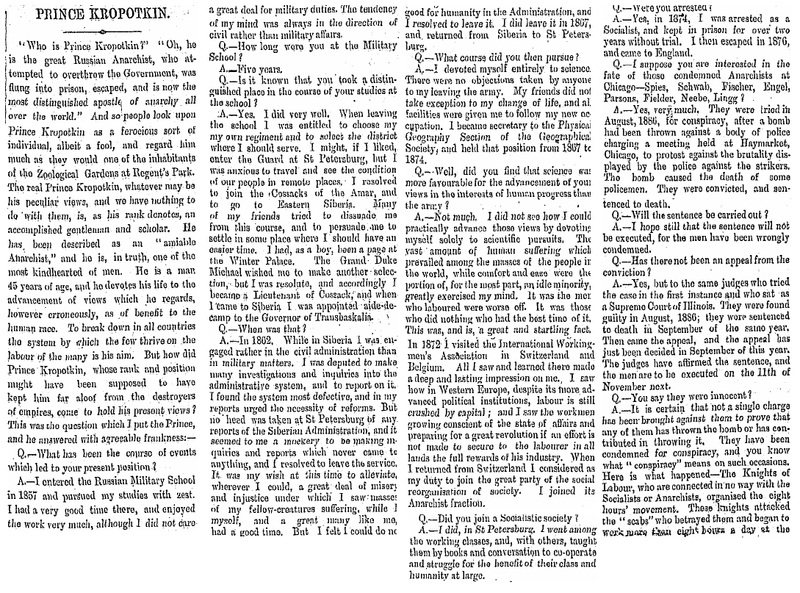 This interview starts with the journalist’s view that Kropotkin is “the most distinguished apostle of anarchy all over the world” and that “..people look upon Prince Kropotkin as a ferocious sort of individual, albeit a fool, and regard him much as they would one the inhabitants of the Zoological Gardens at Regent’s Park. The real Prince Kropotkin, whatever may be his peculiar views, and we have nothing to do with them, is, as his rank denotes, an accomplished gentleman and scholar. He has been described as an “amiable Anarchist”, and he is, in truth, one of the most kindhearted of men … to break down in all countries the system by which the few thrive on the labour of the many is his aim”. We have mentioned previously the activity of anarchists in the Ireland of the 1880s and, while not mentioned in this article, one would wonder if this contributed in any way to the interview being printed. The fact that Kropotkin was a prince seems to have impressed the journalist and may have had some novelty value, though ‘the Prince’ himself had dropped the title at the age of twelve. Certainly well known, Kropotkin arrived in London in 1886, after fourteen years of political activity in Russia and Switzerland, and a three year stretch in a French jail. He was sentenced by a police-court magistrate (under a special law passed after the suppression of the 1871 Paris Commune) on the grounds that he had belonged to the International Working Men’s Association. Acknowledged and respected internationally both for his scholarship and for his revolutionary activities, Kropotkin’s release from the French prison was the result of lobbying from within the French parliament. Kropotkin had yet to publish his major works like Mutual Aid: a factor in evolution or The Conquest of Bread, but the shape of things to come was signposted by articles such as What Geography Ought To Be (1885) and The Scientific Basis of Anarchy (1887). The interview focuses first on his background and intellectual conversion to anarchism, then the campaign to free or pardon the Haymarket 8 in Chicago (later unfortunately the Haymarket Martyrs) which the journalist compares to the Manchester Fenians. It ends with Kropotkin’s definition of anarchy and a reference to a series of articles in the Nineteenth Century (1888) and The Great French Revolution (1889). 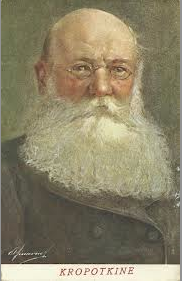 For more information on Kropotkin check out the ‘Peter Kropotkin’ entry on Wikipedia. 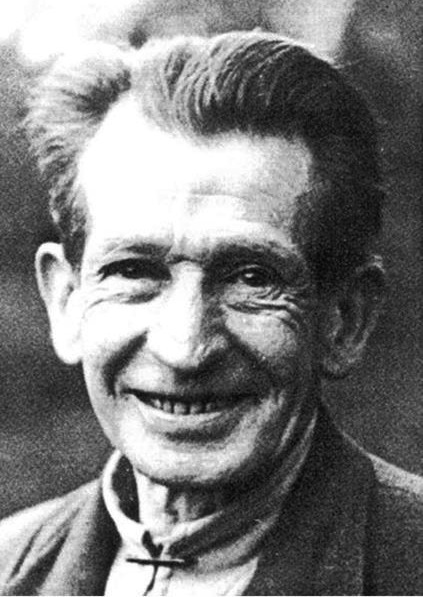 For an assessment of his scientific endeavours see the article ‘Kropotkin was no crackpot’ by evolutionary biologist Stephen Jay Gould and for more on background and context you can read ‘The Russian Anarchists’ by Paul Avrich.